I’ve always been terrible at writing them since high school, and that hasn’t changed much (except I no longer have shaggy hair, and grew an additional foot taller). But, you’re not here to learn about my cringey high school years. You’re here because you have a curious mind and want to learn more about the wonders that are Voice Assistants, and their search abilities! In this post, I’ll guide you through the current applications of this technology, both inside and outside your home, and what you need to consider in order to offer a fantastic user experience for tomorrow. Ah, okay I can appreciate your perspective. However, have you ever wondered how many teaspoons were in a tablespoon while your hands were preoccupied with cooking? What about adding ice cream to your shopping list without leaving the comfort of your couch while binge-watching Netflix? Yeah, me too. In fact, companies already offer many devices and assistants to accomplish such things. Microsoft has integrated their virtual assistant, Cortana, into Windows 10 and Xbox. Apple’s Siri has been available on iPhones since 2011, and other players such as Amazon and Google have products in this space as well. Your phone will definitely know where to find the best pizza. I recently attended PubCon in Las Vegas and listened to Gary Illyes host a few keynote lectures. He spoke to the increasing volume of voice searches being conducted on Google’s search engine, and he’s not wrong. In fact, SearchEngineLand states that voice search makes up 20% of all mobile queries. When travelling around somewhere new, you may be curious to know where you are. Through vocally searching “Where am I,” Google can display a user’s current location. If you then search for “Show me things to do here,” a listing card will display in position 0 with different local attractions. 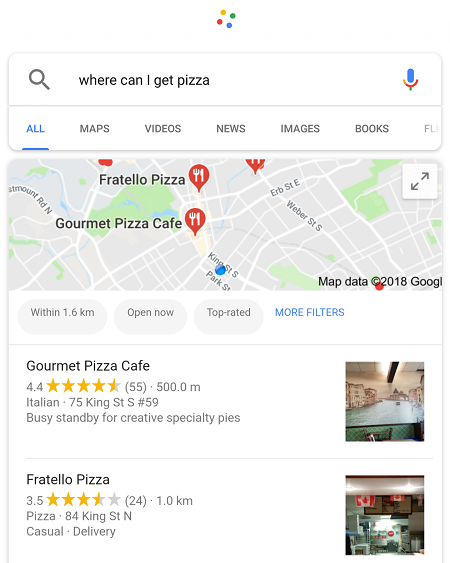 Furthermore, if you want to learn more and ask to “call X,” X being a local cafe, your smartphone will begin to call that local business listing. Through voice search, Google has been able to create a natural dialogue between their search engine and its user. Searching with voice also encourages longer queries as it’s easier to speak than type, which is especially useful since Google’s word recognition error rate is only 8%. This provides better insight for marketers as the longer and more natural the query, typically the clearer the search intent. For example, if I searched for “best Montreal smoked meat,” I’d receive various results for restaurants or recipes. However, if I change my voice query to “where can I get the best smoked meat in Montreal,” I receive a card full of restaurants showcasing their finest goods, specific to that geographic location. Marketers and advertisers need to be aware of how their branded terms appear in voice search. Purna Virji conducted a fantastic experiment showcasing this with Yves Saint Laurent. Using both Siri and Cortana, she asked them to “show me Yves Saint Laurent bags,” and instead the queries presented included “show me you send the wrong bags” and “show me the song laurent bags.” Based on her findings, advertisers need to be fully aware of how their brands are being presented, and to what degree they need to account for misspelling based on mispronunciations. In November 2014, Amazon released their Alexa-powered smart speaker named Echo. Why did that matter for Amazon’s sellers and buyers? Because you now have the ability to make purchases on Amazon’s store through your own voice. That’s a huge opportunity for Amazon to increase their customer’s annual spend and purchase frequency! According to GeoMarketing, 82% of Amazon Echo owners also subscribe to Amazon Prime, and in 2013 alone, Amazon Prime members spent, on average, $1,340 each, which was more than double a non-Prime shopper. Not only does Amazon have customer loyalty working in their favour, but Echo owners also spent 10% more than they did before owning the smart speaker, and placed orders 6% more frequently. I can only imagine how many more voice assistance devices with e-commerce integrations are being developed in order to take advantage of this newly established opportunity. With your voice data being constantly transmitted and processed, organizations need to consider the privacy and security implications of such. In November 2017, Google was found keeping copies of voice clips of searches their users had made. What was even more unsettling was that “background chatter could be enough to trigger [the] recording.” Thankfully, you’re able to sign into your Google account and delete any of the stored clippings through your settings. However, this raises a serious concern for the future of voice-powered technologies. With organizations storing potentially sensitive information on each your devices, it poses possible security breaches for everyone, from everyday users to powerful political figure heads. Patrick is a Group Manager proudly leading a product team that builds seamless web and mobile experiences for our digital media company. Previously, he co-founded a food tech startup in Canada's Technology Triangle and worked at Microsoft Canada. He loves long walks on the beach, cappuccinos, hip hop, and buying too many books that he eventually plans on reading.